The Boker Plus Anti-MC combines two modern materials to create this elegant pocket folder. Titanium handle construction guarantees that you're getting one of the lightest and strongest handle builds possible. Joining that to the ceramic cutting blade creates a knife that's invulnerable to rust and corrosion. If you work around seawater, that's a definite plus since even stainless steel degrades quickly in that brisk salty air. Slicing is the strong point of this knife, not prying. Levering with the blade or dropping it on a hard surface could cause major damage, and even cutting requires a different technique, based on straight cuts instead of cutting a curved chip. If you like knives that are sharp, the 3-1/4-inch ceramic blade's cutting edge is plenty of reason to own this knife. Heavy use might cause micro-chipping of the knife's edge, but even that doesn't greatly affect the way the Boker Plus Anti-MC cuts. Micro-chips simply cause the edge to grip a little faster. Run a finger carefully along the edge of a chert arrowhead, and you'll get the idea quickly. 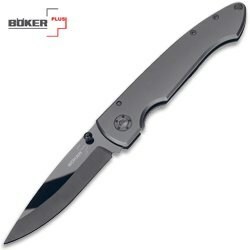 Although Boker does call this a tactical folder, the clean design and conservative blade style make this a pocket folder nearly anyone can carry. The pocket clip keeps the knife securely in place, and a lanyard hole allows owners to add a wrist loop for knife security in tricky locations. One-handed opening and integral frame lock add to its practicality. For another ceramic cutter from Boker, see the Boker Infinity.